With so many needs for care all around us, there’s a real demand for trained Stephen Ministers to walk with hurting people. In fact, as more people learn about the value of Stephen Ministry, the demand is likely to keep growing. If you have thought about the possibility of becoming a Stephen Minister and would like to know more, mark Saturday, April 7 on your calendar. That’s when we will host a Stephen Ministry Introductory Workshop. 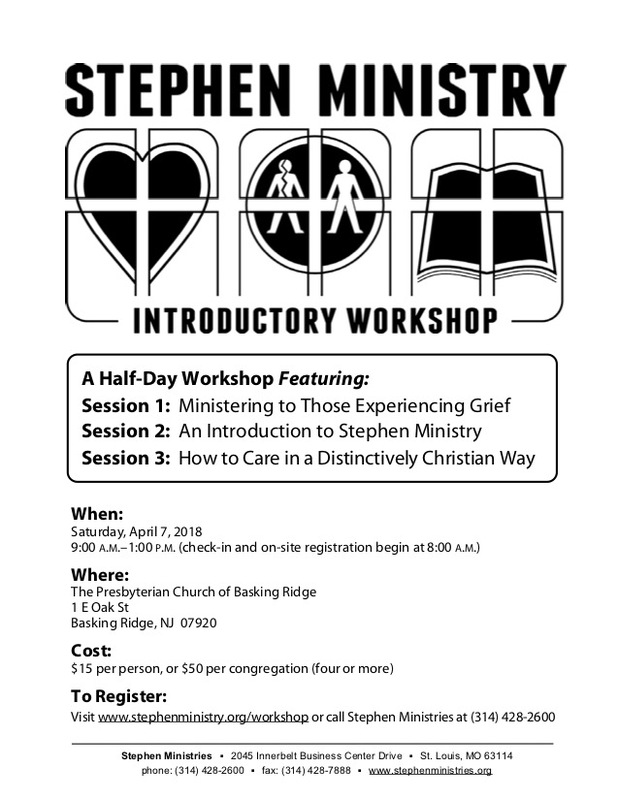 This workshop describes what Stephen Ministry is and offers a sample of Stephen Minister training—and members of BRPC are welcome to attend at no cost. Feel free to share the information with friends in other congregations, as well as BRPC members you know who might be good Stephen Ministers. If you would like to receive care from a Stephen Minister, talk to Maureen Paterson or to one of our Stephen Leaders (Jane Mahan, Helen Hoens and Leslie Mensak). If you know someone who would benefit from a Stephen Minister’s care, encourage that person to request a Stephen Minister from Maureen Paterson or a Stephen Leader, or ask for his or her permission to make the request yourself. To register visit www.stephenministry.org/workshop or call 314-428-2600. Click to view or download as a pdf.